"Shrimp tempura roll is actually my all time favorite! 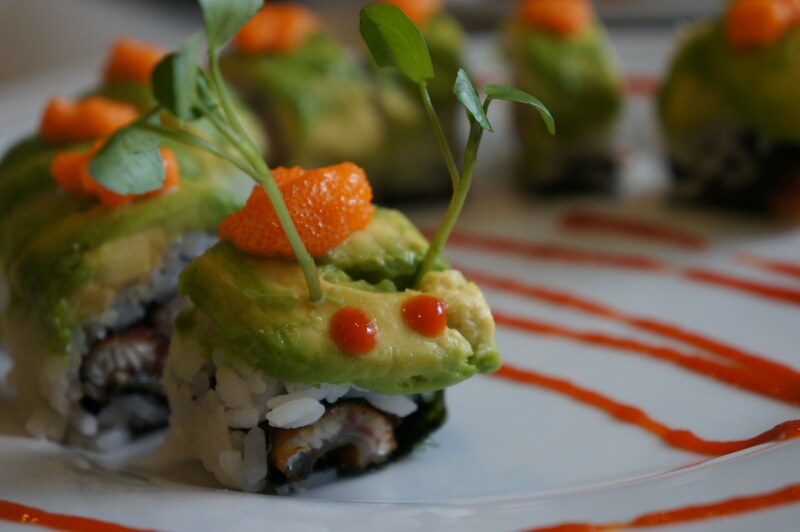 It can be served on its own as a starter dish or as the main ingredient in Sushi rolls like the Dragon or Caterpillar rolls. When preparing quantities, make sure to make a few more than you need as some tend to "disappear" just right after preparation." This page redirects from here. First things first, let’s start with the tempura mix. The tempura mixed can be made from scratch, or using an instant tempura powder. This recipe uses instant tempura powder. If you are interested in being less lazy than I am, there is a good recipe for making tempura mix from scratch by “go-japanese”. For this recipe we will use 3 table spoons of store bought tempura powder, and 3 table spoons of ice cold water. It is important that the water is as cold as possible, so make sure to add a lot of ice to the water and let it sit for a few minutes. 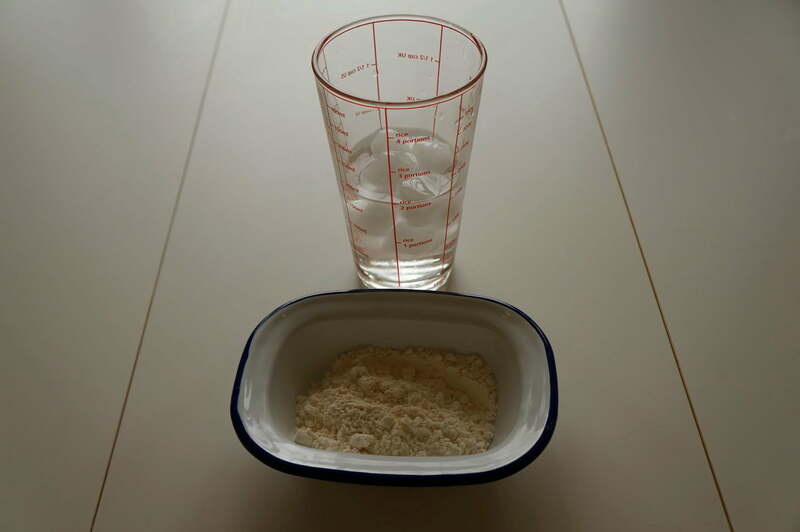 With a spoon, add water to the powder in a ratio of 1:1. Add more powder or water to change the texture of the mix if you feel needed. 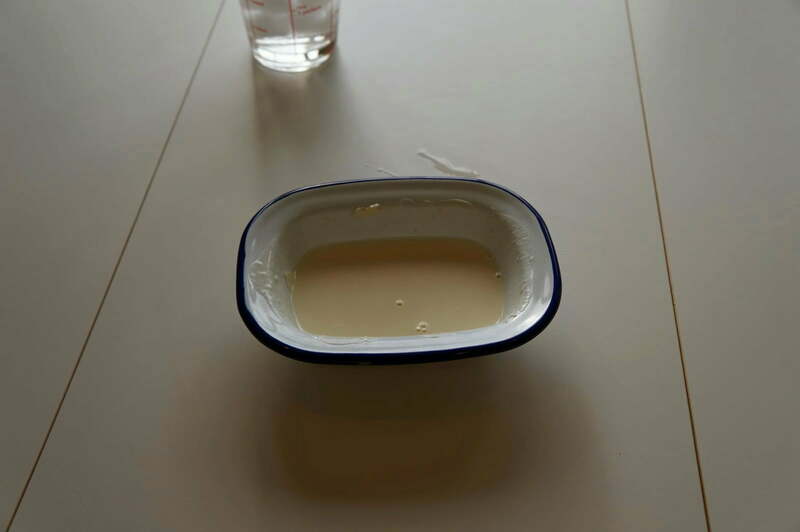 When mixing, mix very gently to keep the mix as flat as possible – try to avoid creating bubbles in the mix. It is okay if the mix is a bit lumpy, but a bubbly mix should be avoided. At this point it is important to clear out that you can use shrimp or prawns for this recipe – depending on which you prefer or simply what you have in your kitchen. So the recipe mentions shrimp referring to either shrimp or prawns. Frozen shrimp is likely to be peeled and sometimes even deveined. If not, you will need to do it yourself. I’d like to invite chef Gordon Ramsay to explain the process. When fried, the shrimp tend to curl too much – so you want to straighten them up beforehand. We do it by making two slits across the “belly” at each one-third point as shown below. 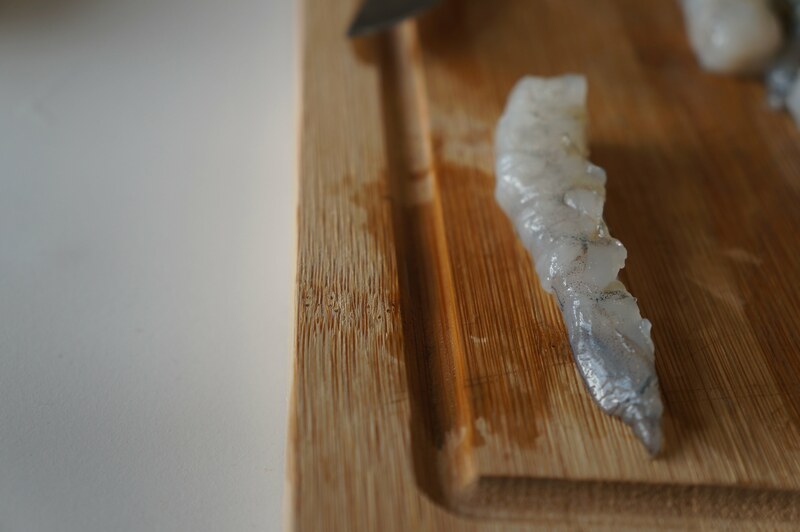 After making the slits, flatten the shrimp onto the board with your hands applying slight pressure. Heat up deep oil in a small thick bottom pan – or use a fryer if you have one. Leave the pan on max heat for a few minutes until hot enough for frying. The optimal amount of oil to use is 2X the shrimp height – or approximately 2 inch (or 5 cm). One trick to tell when the oil is hot enough is to drizzle a drop of tempura into it. 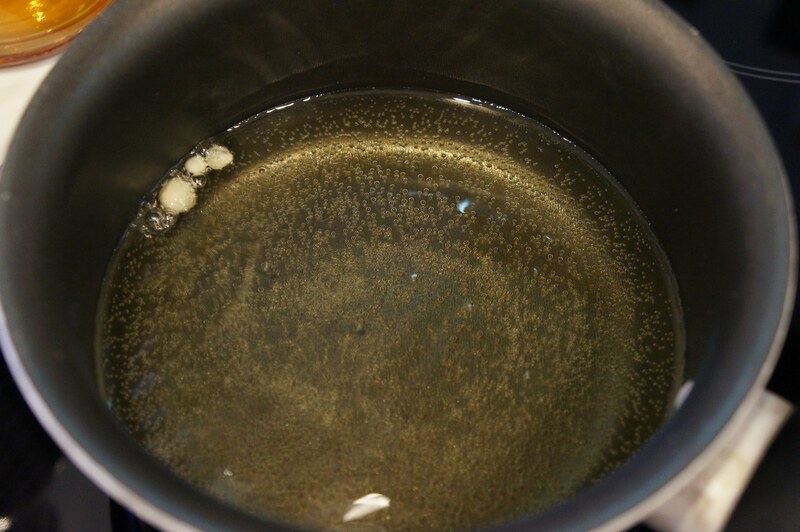 When the tempura starts sizzling, the oil is ready and heat can be reduced to medium. One by one, pick up a shrimp with chopsticks and deep it in tempura. Make sure it is fully covered, and put in oil. It should fry for about 10-15 seconds until crispy golden. You can do 3-4 at the same time but not more as oil temperature needs to remain as stable as possible. 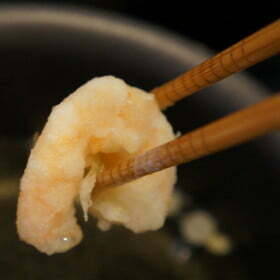 Once finished, put the fried tempura shrimp to soak on a kitchen paper towel and cover with another paper towel. Never store in a closed compartment as locked steam will make it soggy. Shrimp tempura roll is my all time favorite! It can be served on its own as a starter dish or as the main ingredient in Sushi rolls like the Dragon or Caterpillar rolls. When preparing quantities, make sure to make a few more than you need as some tend to “disappear” just right after preparation. Got questions or comments? Talk to us! Use our wonderful comment system below. Please enjoy this picture of a Caterpilla Sushi Roll. This only shows how to make shrimp tempura, not the roll. !!! Thanks for the comment > I added links to the actual roll recipes. My first try was great. My mum enjoyed it. You’re an amazing instructor. I’m so grateful.